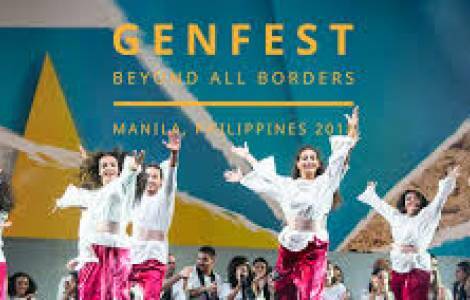 Manila (Agenzia Fides) - Around 15,000 young people from all over the world, including Filipinos from 86 Catholic dioceses, are expected to meet for the Genfest youth festival being organized by the Focolare Movement to be held in Manila on July 6-8. "It is a meeting of young people, 18 to 34 years old, who want to show the world that universal brotherhood, a united world, is an ideal worth living for", says to Fides Avam Inocencio, organizer of the Genfest. "It is the first time it will be held in Asia and outside Europe", Inocencio explained. The festival was born from a prophetic intuition of Chiara Lubic, founder of the Focolare Movement, and started in 1973 and has reached its 11th edition. Over the years, the Genfest has become a great festival of ideas, thoughts and actions that "inspire thousands of young people to change their lives, their future and, ultimately, the world", explain the organizers on presenting the event. The Genfest promotes artistic events, music, dances, exhibitions, forums, meetings. The Catholic Bishops’ Conference of the Philippines (CBCP) has endorsed the event. Several bishops have encouraged Catholic youth to support and attend Genfest. "It would be good to send delegates from every parish to this big event", said Bishop Honesto F. Ongtioco of the diocese of Cubao.